Let efficient, long-lasting LEDs brighten your garden pathways, patios and more. This low voltage landscape light features an LED array that's both energy efficient and long lasting. The tulip-shaped lamp head holds three LEDs that use a mere 1.5 watts of power, but give the equivalent to a 20 watt regular bulb. Must be used with existing low voltage landscape lighting systems. 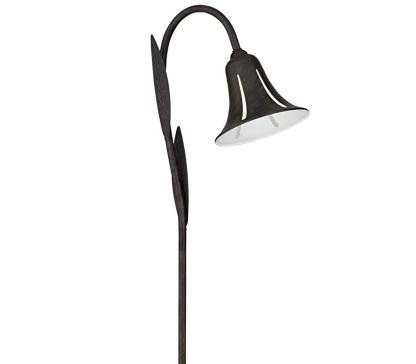 • Tulip LED landscape light. • For existing low voltage landscape lighting systems. • With one 1.5 watt LED. • Shade head is 5 1/2" wide, 5" high. • 6 3/4" high ground stake.